Which countries are winners and losers in Obama's 2014 aid budget? Last week, the Obama administration released its international affairs budget request for fiscal 2014. Amid fiscal constraints in Washington, the budget request’s topline figure of $52 billion would maintain U.S. international affairs spending at roughly the same levels as in fiscal 2013 after sequestration. The administration’s proposed 2014 international affairs budget, which also calls for a sweeping overhaul of U.S. food aid, has been mostly welcomed by the U.S. aid community. East Asia and the Pacific is the only region where most U.S. bilateral aid programs are likely to expand in fiscal 2014. In fact, only five of 13 U.S. bilateral assistance programs in East Asia and the Pacific are expected to operate with diminished budgets next year. In an effort to reassert U.S. influence in the region, U.S. President Barack Obama has pledged to intensify his administration’s engagement in East Asia and the Pacific. In the Middle East and North Africa – the region which has historically received the largest share of U.S. international affairs spending – eight of 10 U.S. bilateral aid programs have been slated for cuts in fiscal 2014. However, in its budget request, the Obama administration does set aside $580 million in additional assistance to the region through the Middle East and North Africa Incentive Fund. The fund, which failed to garner backing from Congress for fiscal 2013, aims to support countries in the region undertaking political and economic reforms. Meanwhile, following the Obama administration’s rollout last year of its strategy for enhanced engagement toward sub-Saharan Africa, 17 of 34 U.S. bilateral aid programs in the region are expected to operate with smaller budgets in fiscal 2014. The administration has announced that it is increasingly refocusing its efforts in sub-Saharan Africa from aid to trade. Here’s a look at how some of the most significant U.S. bilateral aid programs fare in the Obama administration’s fiscal 2014 budget request. 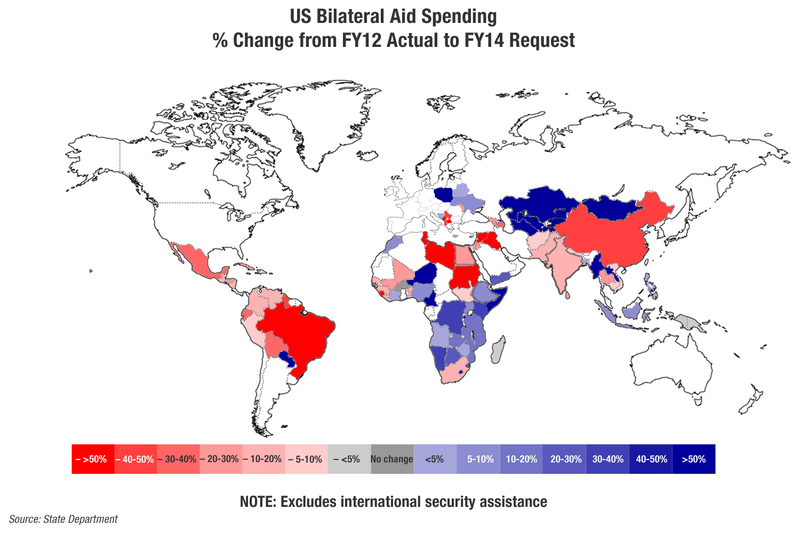 (The map above provides a snapshot of the impact of the budget request on funding levels for U.S. bilateral aid programs around the world). For fiscal 2014, the Obama administration has requested $75 million in bilateral assistance to Myanmar, representing an increase of 62 percent over 2012 levels. In recognition of the country’s political reform process, in July 2012, USAID reopened its mission in Myanmar after a 23-year hiatus. Later that year, during his historic visit to the once-pariah state, Obama announced that over the next two years, the United States would provide $170 million in humanitarian, democracy and governance, and economic development assistance to Myanmar. In 2011, the Obama administration launched its Partnership for Growth initiative which aims to mobilize resources and expertise from both the U.S. government and select bilateral partners to jointly address constraints to broad-based economic growth. In the administration’s fiscal 2014 budget request, three of the four Partnership for Growth countries would record substantial increases in their aid budgets from fiscal 2012: El Salvador (51 percent), Tanzania (17 percent) and the Philippines (4 percent). Interestingly and surprisingly, U.S. bilateral aid spending in Ghana – the fourth Partnership for Growth country – is expected to drop by 7 percent from fiscal 2012. According to the administration, it has selected these four countries as participants in the Partnership for Growth on the basis of their commitment to democratic governance and sustainable development. Following Obama and Indonesian President Susilo Bambang Yudhoyono’s 2010 signing of a comprehensive partnership between their two countries, the United States has bolstered its development engagement with Jakarta. For fiscal 2014, the Obama administration has requested $152 million in bilateral aid to Indonesia, up 5 percent from 2012 levels. Only last month, the U.S. Embassy in Jakarta and the Indonesian Ministry of Education and Culture announced a $6 million expansion of the USAID University Partnership Program, which provides funding for joint research conducted by Indonesian and U.S. universities. Following its withdrawal from Iraq in December 2011, the United States plans to wind down its combat operations in Afghanistan by the end of 2014. Against this backdrop, the United States has also reduced its development footprint in the Afghanistan-Pakistan region and more significantly so in Iraq. For fiscal 2014, the Obama administration has requested $1.7 billion in bilateral aid to Afghanistan, down 9 percent from 2012. Meanwhile, the administration has requested $766 million in bilateral aid to Pakistan, representing a decrease of 15 percent from 2012. However, Afghanistan and Pakistan will remain the two largest recipients of U.S. development assistance. On the other hand, Iraq is now poised to have one of the United States’ smallest bilateral aid programs in the Middle East. In 2014, U.S. bilateral aid to Iraq is expected to stand at $22.5 million, a staggering 91 percent reduction from 2012. Until recently, Iraq was the fourth largest recipient of U.S. international affairs spending. For fiscal 2014, the Obama administration has requested $442 million in bilateral aid to South Africa, down 18 percent from 2012 levels. The bulk of U.S. foreign aid to South Africa currently supports HIV and AIDS programming under the U.S. President’s Emergency Plan for AIDS Relief. In a bid to foster the long-term sustainability of PEPFAR, the Obama administration had earlier pledged to increasingly transfer the initiative’s financial and managerial burden to many of the initiative’s host countries, including in South Africa. Both the U.S. and South African governments anticipate that in the coming years, PEPFAR funding for South Africa will gradually decline to $250 million by 2017, just above half of 2012 levels. Despite strong bipartisan backing for U.S. development engagement in South Sudan, the U.S. foreign aid budget for the country is likely to be slashed significantly in fiscal 2014. For the next fiscal year, the Obama administration has requested $330 million in U.S. bilateral assistance to South Sudan, representing a reduction of 8 percent from 2012 levels. According to the administration, the United States’ continuing assistance to South Sudan aims to accelerate progress in key areas including governance, conflict mitigation, agriculture, infrastructure, and basic education. In 2011, the United States joined other donors in expressing concern to the government in Juba over the alleged misuse of foreign aid to the country. What’s next for America’s global HIV/AIDS program?